Master Bedroom Ideas - Master Bedroom Decorating Ideas & Bedroom Makeover Ideas for a More Organized Home! These master bedroom ideas and bedroom makeover ideas will have you waking up refreshed, energetic and ready to start your day! So it is time. It's time to reclaim it from the mounds of toys; it's time to eliminate the clutter overflow from the closet; it's time to kick out all intruding items that aren't yours and/or belong somewhere else in the house; it's time to salvage what is rightfully and solely yours! Utilize the general organizing procedure of purge, sort and store, and apply it when organizing the bedroom. • One of my best and simplest master bedroom ideas is to declutter. Start with one section of the room and work your way around. Get rid of any items that are unwanted, never utilized, or no longer usable. **Don't forget to go through the nightstands, under the bed and any other out-of-sight storage areas. • Pick up ONE item at a time, and decide if it is worth keeping. In order to accomplish this, ask yourself appropriate questions (Is it still usable? How often do I use it? Do I have more than one of this same item?). • Take out the trash and put the donations in your car. This hinders the possibility of undoing your hard bedroom organizing work. • Distribute items to their appropriate places around the house. This is very important! This room is often taken over by intruding items; simply putting these things in their proper places (in other parts of the home) will enlighten your bedroom's atmosphere. (i.e. closet items need to remain in the closet, dirty laundry needs to be contained in the hamper, toys need to be returned to the kid's room). This is my bedroom! Everything in my bedroom belongs there, and any intruding items get distributed every morning (which takes less than 5 minutes). Thus, my bedroom looks like this every day! • You have cleared your soon-to-be sanctuary of all invading items and can now focus on what's left. Separate the items that you deem worthy of remaining in the bedroom into categories (i.e. books, music, appropriate decorations, and so on). • This is also a good time to rearrange the furniture. Try different arrangements until your goal is met (i.e. move the bed closer to the window for more natural light). Moving things around will not only rejuvenate your personal space but should also improve the flow of traffic moving through the room. • The last step in initially organizing the bedroom is to store your items accordingly. For instance, use your nightstand for books, reading glasses and other items you will utilize when in bed; store winter linens or things not frequently accessed in sliding bins under the bed. • Get into the habit of putting items in their proper places on a regular basis. Take 5 minutes each morning to distribute rogue items to other parts of the house. 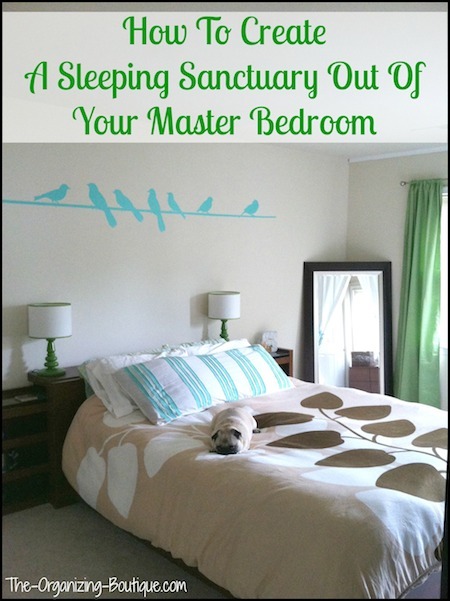 This small task will help you effortlessly maintain your bedroom's harmony. Decluttering is one of my best bedroom makeover ideas! Storage products make organizing the bedroom fun and easy. The following items will help you transform your bedroom from a catchall into a peaceful getaway! Underbed Box with Wheels - a Must for Organizing the Bedroom! A great space for storing items, but often times misused, is the area under the bed. Use these long, clear bins with wheels to effortlessly utilize the underbed storage space. Looking for a durable, lightweight hamper? Here it is! This hamper has tons of great reviews, so check it out. Have you considered purchasing furniture that has the storage built into it? Take a look at these! Looking for small bedroom ideas? Use bed risers like these to lift your bed and create even more space under there! Check out these plastic storage drawers and other rolling underbed storage options for easy and convenient bedroom organizing and master bedroom ideas! Get organized and add to your master bedroom decor by using stylish organizing products like these canvas storage bins. They match any interior design and can be used to hold a huge variety of things. Looking for master bedroom decorating ideas? Use stylish furniture that also offers ample storage like these corner wardrobes and cabinets! Want more master bedroom ideas? Here's how to set up a bedroom and 3 ridiculously easy tasks to maintain bedroom organization.